I seem to be fixated on Sicily this summer and with good reason. A beautiful part Italy, I have spent a bit of time there during past summers and look forward to my next viaggio. When I can’t travel physically, I can always travel thanks to the wines I drink and write about. This post is no different. 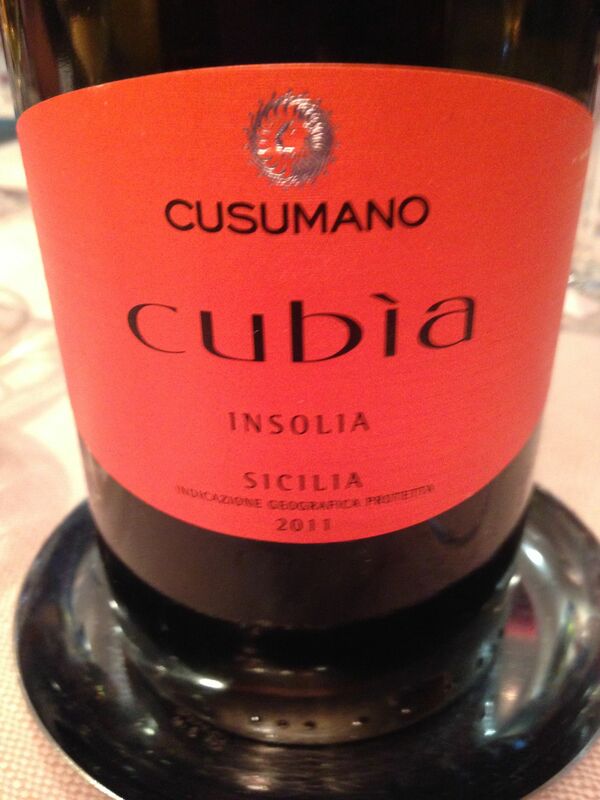 Today’s winery of the week is Sicilian, Cusumano. I met Diego in 2010 during Vinitaly when I was doing some translation work for a wine magazine meeting with numerous producers. I remember his warm and friendly smile and I have seen him at numerous tastings throughout the years. Thanks to Tony Didio, I finally had the good fortune to sit down with Diego and discuss his family winery a bit more in depth and to sample different wines although the one in the picture above remains a favorite from this winery. Cusumano has a number of vineyards around the Palermo area and can count on grapes from over 500 hectares. Sagana is a wine I first tasted back in 2010 and have since had the pleasure of drinking a number of times. 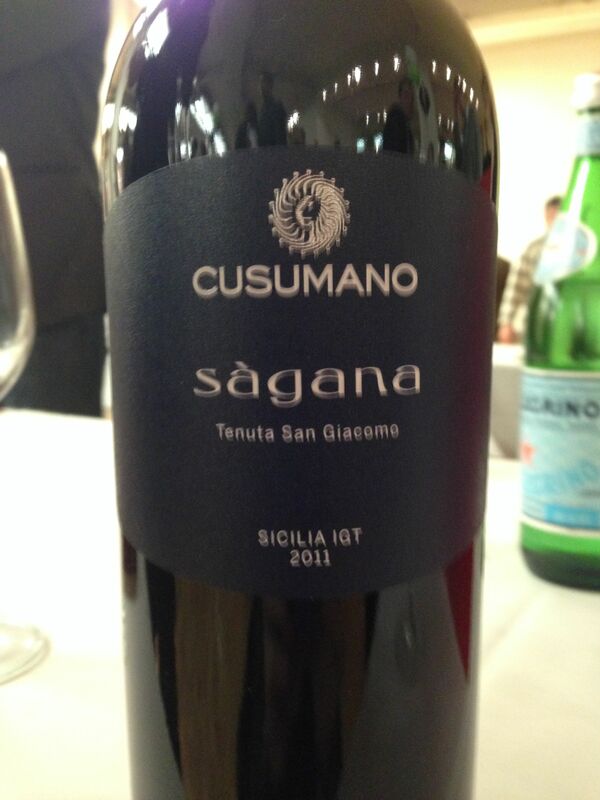 This latest occasion showed the wine at its finest, paired with a wonderful steak, Sagana made from 100% Nero d’Avola. The wine undergoes malolactic fermentation in 20 hectoliter barrels and then ages in those same barrels before being released to the market. The property where this wine is made is located at 400 meters above sea level. It is also 10 kilometers from the sea and subject to the scirocco. I thought the wine had a plushy mouthfeel, great minerality and acidity, big juicy tannins, and earthy and chocolate aromas and flavors. It had a gorgeous finish and was balanced and harmonious throughout. I tried a number of their other wines as well including Cubia, Jale, Noa and Moscato dello Zucco. Cubia 2011 was very a fantastic white wine made with grapes that grow at 700 meters above sea level in what is considered cool climate viticulture at their Tenuta Ficuzza located on the Piana degli Albanesi (PA). The terroir here has consierable clay. This wine is made with Inzolia. It also ferments in 20 hectoliter barrels and remains on its lees for six months before fining. I loved it. It had great texture and a waxy quality that I always find with Chenin Blanc. It had rich and nutty flavors and according to Diego was a great expression of the terroir of Ficuzza. Jale is also from Ficuzza but is made with 100% Chardonnay grapes and spends time fermenting and aging in barrique rather than larger barrels. It also has an interesting waxy flavor with classic Chardonnay notes of apple, butter and oak. Noa was a blend of Merlot, Cabernet Sauvignon and Nero d’Avola, a “super Sicilian” if you will. 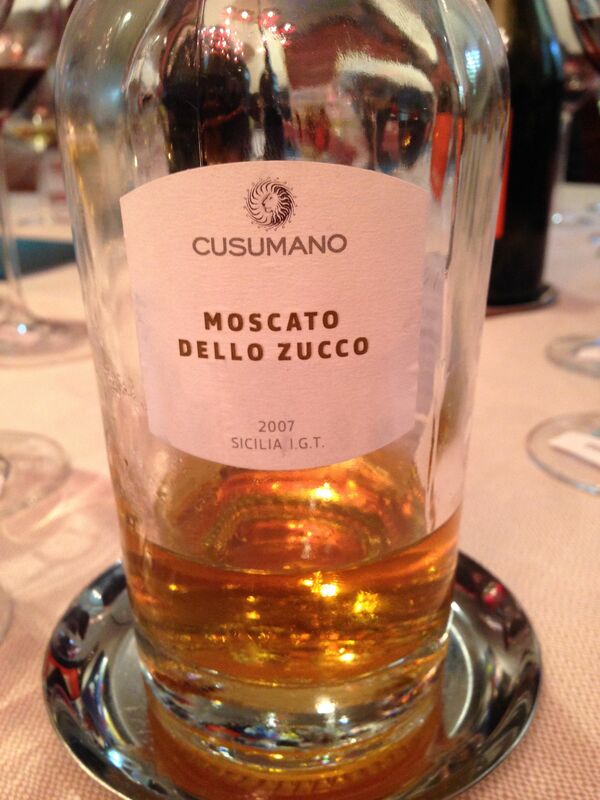 One wine that was a real surprise was the Moscato dello Zucco. Made from 100% Moscato Bianco, the grapes are dried in the cellar and the must eventually ferments in small wooden barrels called caratelli. I am a sweet wine fan so this was right up my alley with waxy, almond notes and hints of orange and pears. It also had great acidity. Diego also discussed his family project for their new winery called Alta Mora in the Etna area. They have 15 hectares between Castiglione di Sicilia and Randazzo. He is looking forward to the family producing Nerello Mascalese. He seemed quite excited about the new project. They presented some of the wines at Vinitaly and it appears that we should see the wines by the end of the year perhaps here in the US as well. I just saw Diego last week and had the opportunity to try Alta Mora Etna Bianco 2014 that won the Tre Bicchieri Award from Gambero Rosso. Made from Carricante grown at 600 above sea level, it had great acidity and minerality. It was fresh and engaging with great white fruit aromas and flavors and floral hints as well on the attack. It was full bodied and enveloping and to me it sang of Sicily and on the frigid day of the event last week, it really made me long for some Sicilian warmth.